The holiday season is a great time to give back and volunteer your time for a good cause. The Washington, D.C. area has many charitable organizations that recruit volunteers to prepare and serve holiday meals, collect and wrap gifts, visit the sick or elderly or just spread some holiday cheer. If you’d like to volunteer in the capital region, here are some local organizations to contact. The Holiday Project - The organization arranges visits to people in nursing homes, hospitals and other residential institutions in Washington, D.C., Maryland, Virginia, and Delaware. Volunteers provide attention, conversation and companionship to those who would not otherwise have a celebration during the holiday season. Capital Area Food Bank - Anyone can make a monetary donation or help with a number of holiday giving projects. This is the largest, public nonprofit hunger and nutrition education resource in the region. Volunteer opportunities available, including hosting a digital food drive and helping sort and pack food that will be distributed to area residents. Toys for Tots - The Washington, D.C. program provides toys to brighten the holiday season for children in local needy families. Any individual, business or organization can hold a toy collection drive. You may also make a donation at more than 400 drop off sites in the DC area. Food & Friends - This organization provides meals to support men, women, and children living with HIV/AIDS, cancer, and other life-challenging illnesses. Volunteers are needed to help in the kitchen as well as to make deliveries. When you purchase your Thanksgiving pie from Food & Friends, you contribute to every step that goes into providing one full day of meals for our neighbors living with critical illnesses. Salvation Army - Anyone can donate money or host their own personalized Red Kettle to gather donations from others, and the organization also hosts the Feast of Sharing where volunteers provide meals and other services to people in need. Adopt-a- Family Program - The holiday program is run by the Jewish Social Service Agency and organizes volunteers to collect gifts for the needy. JSSA provides eldercare services, Meals on Wheels for the elderly, early childhood intervention for developmental disabilities, services to people with autism and their families, hospice care, mental health services, support to people with all types of disabilities, and more. 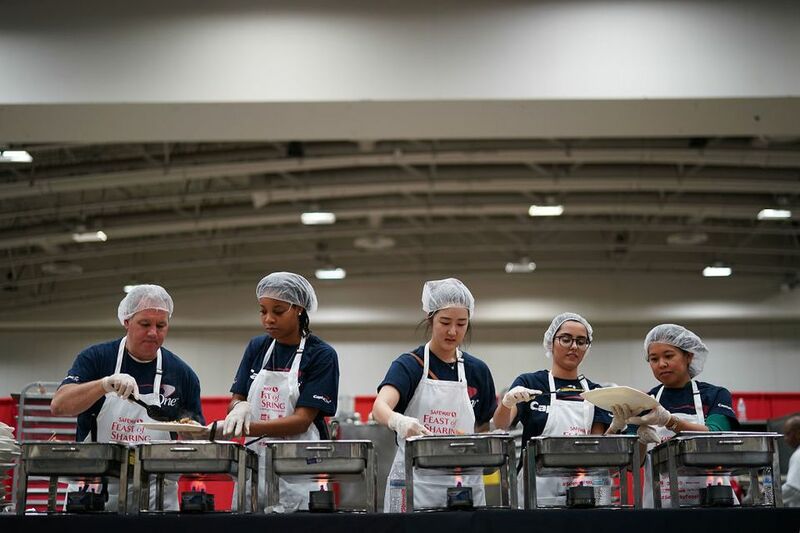 Washington DC Jewish Community Center - The Morris Cafritz Center for Community Service (MCCCS) organizes high-impact community service projects and events that address unmet needs in the Washington, DC metropolitan area. Volunteers take responsibility to enrich the lives of others and in doing so enrich their own. The organization has active partnerships with over 100 local social service agencies. For the holidays, volunteers serve Christmas lunch to seniors, visit with a homebound patients who don't have family in the area or play games with the kids at a homeless shelter. Projects range in from 1-3 hours and vary in activities.